I’ve been making versions of this chicken skillet for some time now. It’s one of those recipes that I just tossed together one day when I had no desire to cook but I needed to get dinner on the table. I don’t know why I haven’t shared this recipe sooner. Probably, because I prepare it when things are nuts and I am exhausted. I love recipes like this because they are easy to prepare, flavorful, and healthy. Chicken skillets make the perfect weeknight dinner option. I also, like to double the recipe to have for lunch the following day. I will usually reheat the chicken and vegetables and toss them with a fresh bed of salad green. Drizzle with a little olive oil and balsamic vinegar and lunch is ready. 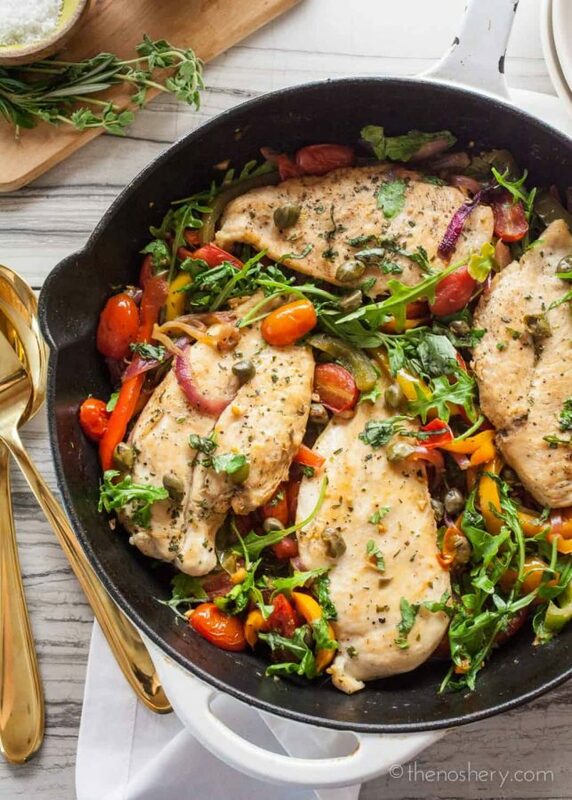 If salad greens aren’t your thing and you are in desperate need of carbs serve the chicken with crusty bread or over pasta with some parmesan cheese. This recipe has a great amount of versatility. If you are missing any of these vegetables or maybe aren’t a fan of them feel free to switch them out. I think mushrooms, zucchini, or asparagus would be some great ways to change this chicken skillet up. 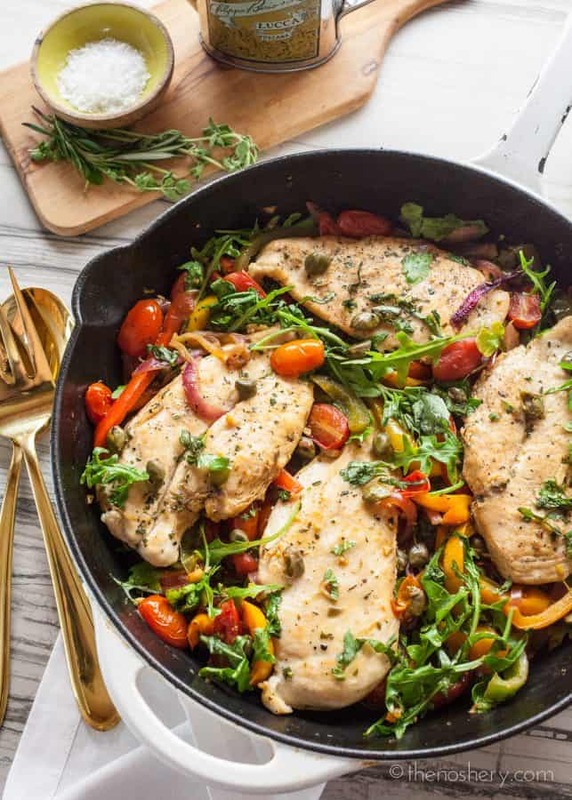 Make weeknight dinner easy with this Italian Chicken Skillet. 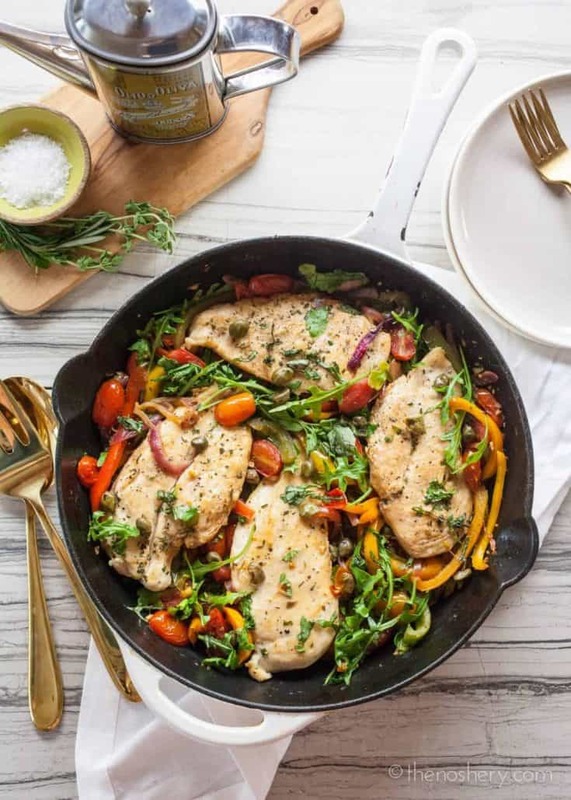 A complete meal loaded with vegetables and chicken all in one skillet. Pat chicken dry. Season on both sides with 1/2 tbsp dried oregano, 1/2 tsp salt and 1/2 tsp black pepper, set aside. Heat 2 tbsp olive oil in a large cast iron skillet. Brown the chicken cutlets on both sides, about 3 minutes on each side. Transfer the chicken cutlets to a plate. In the same skillet, add peppers and onions, saute on medium-high for 5 minutes. Then add the tomatoes, garlic, the remaining oregano, salt, and pepper. Cook for another 10 minutes, stirring occasionally. Add white wine, bring to a simmer and let reduce. Add the lemon juice and chicken broth. Bring the liquid to a boil and lower to a simmer. Return the chicken back into the skillet. Cook uncovered for another 10 minutes or until the chicken is fully cooked. Stir in arugula just before serving.